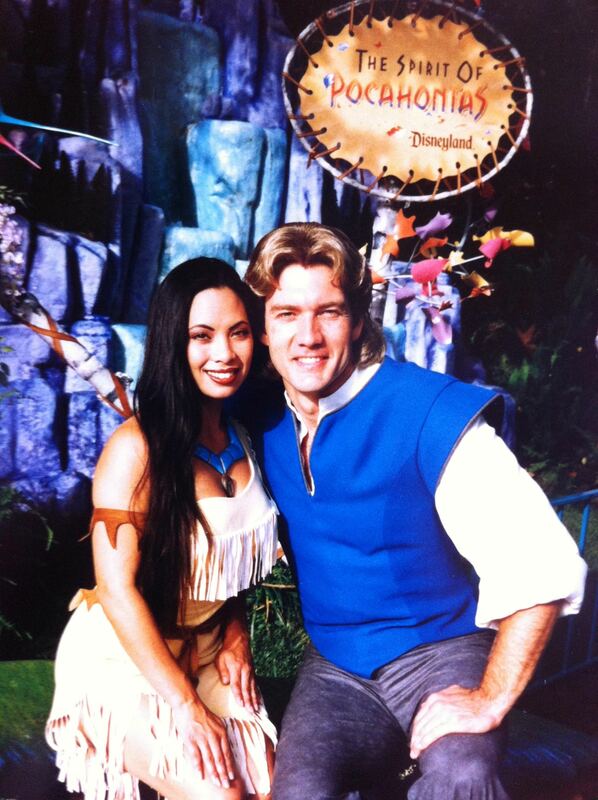 Once upon a time, in a faraway land called Anaheim, I went to Disneyland five days a week for two years– I’m not saying that I worked there, but one might say that I was a “good friend” of Pocahontas…and an original one at that. ‘Twas a magical place, and even after a full day in the park, I still loved re-entering as a civilian (guest), going from ride to ride (attractions), and taking in all that makes Disneyland, Disneyland (magic). With its meticulously manicured plants decorating all corners of the park; ever-smiling cast members pointing with two fingers to politely show you where to find the Matterhorn, Cinderella, stroller parking, the restroom, or your lost family members; ambient music perfectly picked for each “land”; immaculate streets and sidewalks cleaned constantly by custodial staff in expertly pressed whites, and the delicious smells of popcorn, cotton candy, churros, corn dogs, and big fat turkey legs wafting through air and somehow convincing you that calories do not exist in The Magic Kingdom, Disneyland is designed to make you happy. 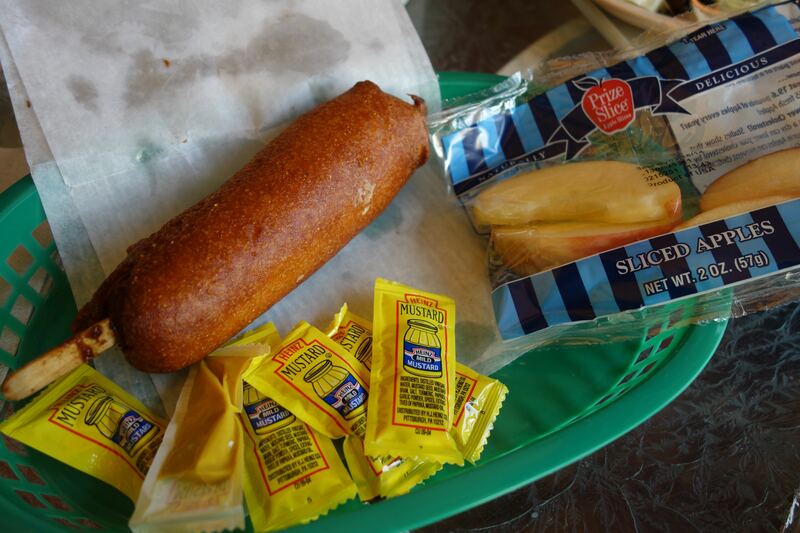 Disneyland corndogs always make me happy. And for me, in many ways, it is “The Happiest Place on Earth”. My earliest memories of Disneyland go back to a time when I had a cross between a bowl-cut and a Dorothy Hammil ‘do; when green polyester textured bellbottoms with a striped turtleneck were acceptable–nay, fashionable; when Mickey Mouse looked (in retrospect) kind of creepy; and when E-tickets were hoarded until the end of the day so as not to be let down by the “baby rides” too soon. I recall the elation I felt when I was finally tall enough to ride Space Mountain, just 6 years after it made its debut. There was the time when my cousin first went through the Haunted Mansion, and we shrieked with delight and feigned fear at the ghostly ghouls as we cruised along in our “doom buggy”. The first time I went without my parents was a big deal. Budgeting my money for the day, I felt like a grown-up; giggling virtually non-stop the whole day through with my best friends, I felt like the teenager I was. 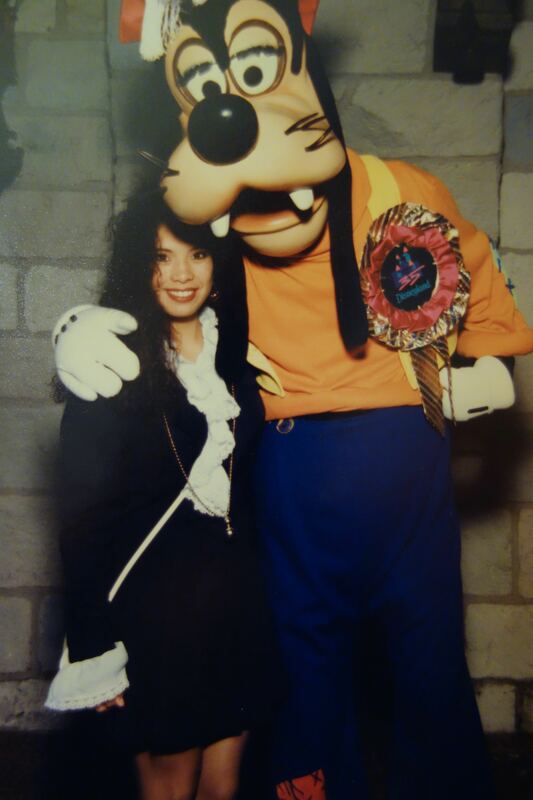 Trying to rock the pirate look with Goofy…and failing. Grad Night brought a slew highlights: having the run of the park with my classmates and a handful of other schools, dancing to Jodi Watley and Keith Sweat at their private concerts, riding Space Mountain back-to-back five times with hardly any line, and a photo of me and Goofy with permed hair, a ruffled blouse, and high heels (me, not Goofy). 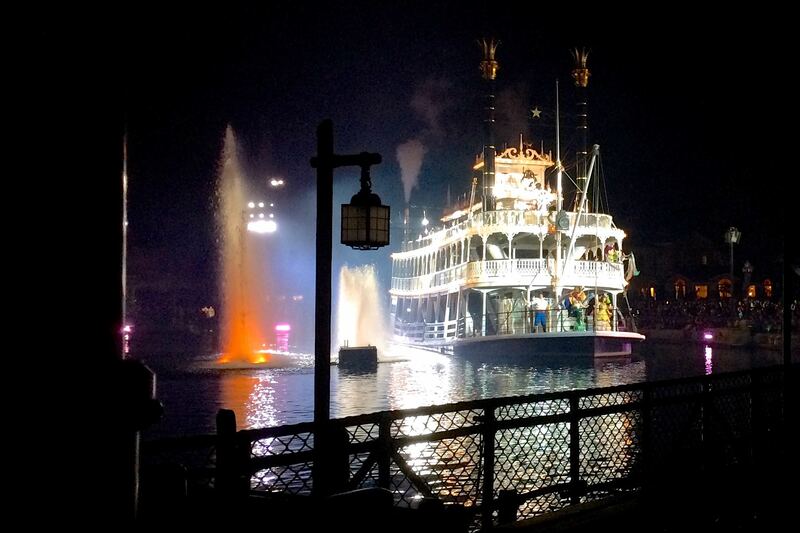 The Mark Twain and a cast of Disney favorites on the Rivers of America during the spectacular finale of Fantasmic. And even to this day, two decades after Fantasmic premiered (watch the full show here), whenever I watch this show on the Rivers of America, I allow myself to get caught up in the fantasy, the oh-so-stirring music, the technology, the pyrotechnics, the gorgeous costuming and sets, the weaving together of seemingly disparate stories and fairy tales, the battles against good and evil, the creativity, and–most importantly–the joy of believing in the magic that epitomizes everything pure and good that Walt Disney intended this place to be. At the end of the show, Mickey Mouse stands on the roof of the cabin on Tom Sawyer Island, conducting the majestic, swelling music and a skyfull of fireworks, light flashes, and lasers. And with a pow!, zing!, zam!, pyrotechnic Mickey-fingers, and a cloud of smoke, he suddenly appears down on the main stage, giggling, “Some imagination, huh?” And with thunderous applause, raucous woo-hoos, and tears streaming down (at least from my eyes), everyone in the audience agrees. 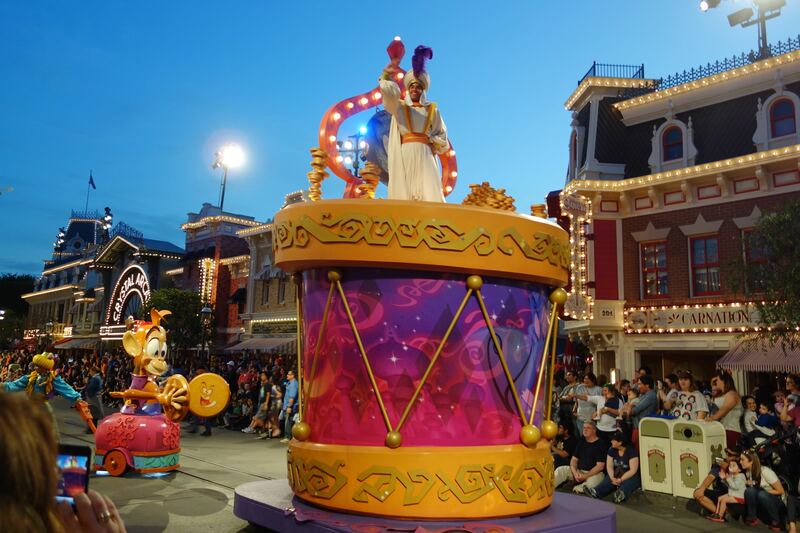 Crowds line Main Street to catch a glimpse of their favorite characters on parade. As an adult, my appreciation for this place has grown, not just deeper but broader. It’s not just about the fairy tale rides or the scream-inducing roller coaster rides, the corny shows and the elaborate Main Street parades, or the characters that seem to have stepped out of the celluloid film and into a fantastical reality. It’s that there’s even more detail, effort, and yes, magic beyond all of those wonderful things that make Disneyland unique and special. Every visit here is somehow different. There’s always something that you might not have noticed the last time you were there, something new to discover, to rediscover. There’s a verse in a Pocahontas song that says, “What I love most about rivers is you can’t step in the same river twice. The water’s always changing, always flowing.” Disneyland is like that. You’ll never have an identical experience, especially if you let yourself be mesmerized by the details, the nuances, and all the little and big things that make The Magic Kingdom so magical. 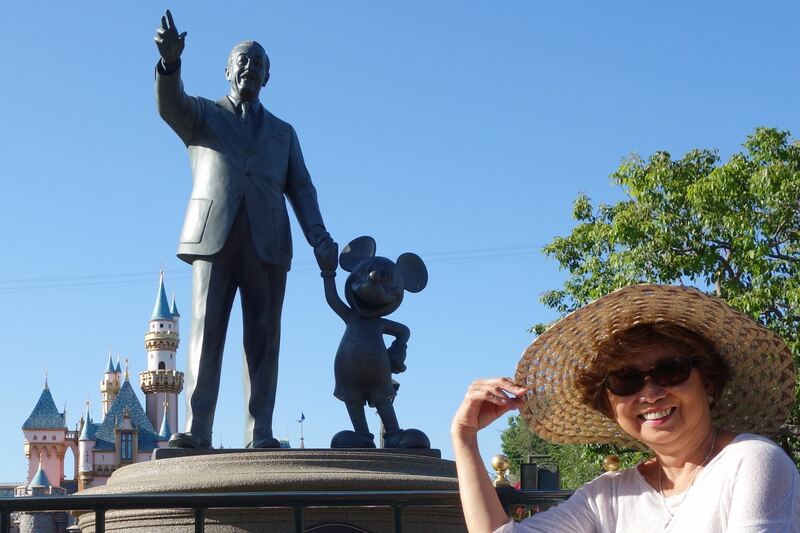 The “Partners” statue–Walt Disney and Mickey Mouse–in Disneyland’s Hub (in front of Sleeping Beauty Castle) and my mom, Virginia, who is always young at heart at Disneyland. Walt Disney once said, “Disneyland will never be completed. It will continue to grow as long as there is imagination left in the world.” As Disneyland evolves, it somehow seems to remain true to its roots. It may not be as it was when it opened in 1955 or even as the first time you or I visited the park. It’s bigger, fancier, busier, bolder, more elaborate, more commercial, more streamlined, more imaginative, and more cutting-edge. But it manages to always hold onto the essence of the Disneyland of my memories. It has tapped into a kind of fountain of youth that keeps it fresh and exciting and keeps all those who experience it young at heart. We run into people who sneer and look down their noses about Disney World and Disney Land because they think they’re too perfect or too artificial. Well, we LOVE WDW, spent 5 days there last December, and wish we could go every year. I love it for many reasons…the beauty, the entertainment, the rides, the surprises, the food at the World Showcase (! ), the friendly people, the flowers. It made me so very happy to read this and know that a world traveler like you loves Disney as well. I’m looking forward to the rest of the posts! Love Disneyland! Just went with our grand kids 5 and 7 last January and had a ball! We have been there since we were kids through our kids, teenagers and our adult kids and now grand kids.